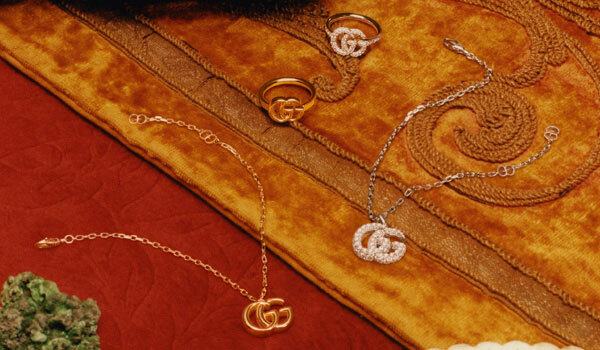 An iconic design from the Gucci archives, the Diamantissima collection was first created in in the mid-1930s and has since been translated throughout its own fine jewellery range. This instantly recognisable design displays a distinctive crisscross diamond pattern, displaying the most intricate detailing for pure luxury. Developed as early as 1930, this signature equestrian side to the brand was due to the style of many of the brand’s initial clients who were local Italian horse-riding aristocrats. A horse bit design was then created to decorate many Gucci items which soon became an icon to the brand and still remains just as iconic today. The Twirl range, characterised by its evocative look, is instantly recognisable from the repeat ‘GG’ pattern. Every strap, handmade by Italian, Gucci craftsman in the Gucci workshop, is hand-embossed to show the utmost attention to detail. The Twirl watches feature a reversible case that can be turned around to transform your statement watch into a chic bangle in seconds, to demonstrate the innovation that goes into Gucci timepieces. The Trademark silver collection showcases the remarkable craftsmanship of Gucci artisans, as suggested by the engraved Gucci trademark – the Made-in-Italy fashion house guarantee. Sleek and refined jewellery pieces make up this exquisite collection, from statement rings, to pretty charm bracelets and necklaces, each one is adorned with feminine motifs, from hearts to butterfly’s and finished with the instantly recognisable Gucci name, to create an elegant, yet powerful impact of designer style. 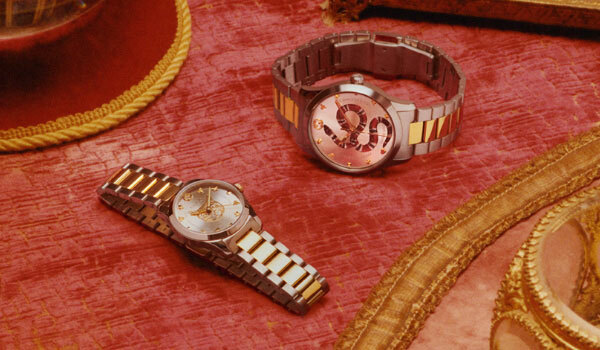 The G-Chrono collection makes a powerful statement of personality. The iconic G-shaped bezel gives these watches instant designer flair, combined with overstated push buttons to fuse stylish sophistication with functionality. The chronograph feature gives these stylish watches a sports-inspired edge, to keep your look masculine, with a sleek and refined finish. We are delighted to showcase the new Gucci Dive Watch collection featuring impeccable design and excellent performance. Each of these lifestyle timepieces features the traditional diver aesthetic, incorporating the unidirectional rotating bezel, and expressing a strong sports allure. With their high-quality Swiss movement and impressive water-resistance, these watches stand the test of time and of style. Shop Gucci from as little as £18.75 per month. Add some serious style credentials to any of your looks with our collection of Gucci jewellery and watches. Synonymous with quality, style and Italian craftsmanship, the brand's signature image is instantly recognisable and is a symbol of modern luxury. Renowned for timeless design and a ground breaking mix of tradition and innovation, there is a hint of audacity and provocation that resonates with celebrities, and which will show off your sense of fun as well as your inimitable sense of fashion. Discover one of the best selections of Gucci jewellery and watches in the UK.